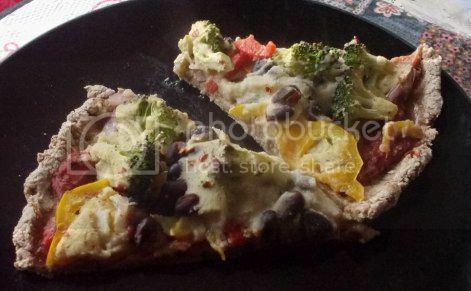 When I reviewed Mark Sutton’s book, Heart Healthy Pizza, I had the opportunity to try some of the most unique and delicious pizzas I’d ever tasted. Following are just two of the literally hundreds of pizzas (possibly thousands; someone ought to work out the math!) that can be created using Mark’s recipes. The basic building blocks for all of his heart healthy pizzas are the crust, bottom sauce, toppings and topping sauce, so that’s the order you’ll find my comments in! 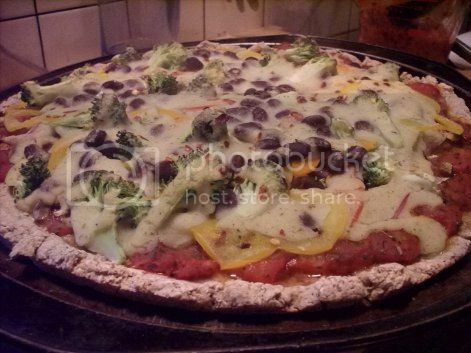 My first pizza started with oat flour crust. What a concept! Oats ground in the blender to make oat flour, then mixed with more traditional pizza crust ingredients to create a whole new crust experience. I’m embarrassed to admit that I got so caught up in the recipe that I forgot a crucial step: kneading. This might explain why my crust didn’t rise very much, but it still cooked up soft on the inside the way crust should be. Plus it made the whole kitchen smell like oatmeal, and how can you go wrong with that? The “Classic Tomato Sauce” also smelled great, especially with the inclusion of balsamic vinegar. This is nothing like the stuff that some companies stick in cans and try to pass off as pizza sauce. No, this sauce has actual chunks of onions and tomatoes, fresh garlic and the traditional Italian flavor of basil. It cooks up into a thick red concoction that makes a great base for any pizza you can imagine. I went with finely diced mushrooms, sliced red onion, sliced bell peppers in four different colors, small florets of broccoli and some leftover black beans. Having both leftover millet and a partial avocado in the fridge, I chose Millet, Avocado and Oregano Sauce for my topping sauce. It started out a little on the bland side, but jazzed right up when I added extra lemon juice and some dijon mustard. 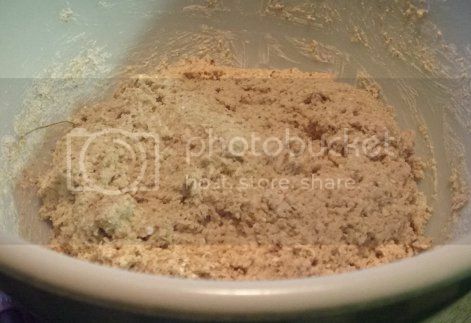 The initial mixture was thin right out of the blender, so I was surprised by how much it thickened during cooking. Although I know “non-cheese” is going to take some getting used to, I loved how light and grease-free this pizza was. I didn’t feel heavy or overfull after eating it. In fact, I felt like I’d just eaten a delicious, healthy pizza! That first pizza gave me a good idea of how to apply Mark’s techniques, so by pizza #2 I was ready for another adventure. I based this one on his simple, yet tasty, whole wheat crust. 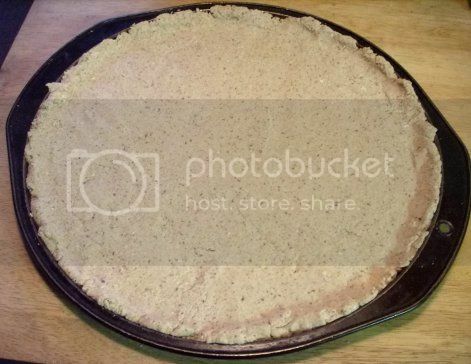 I used a mixture of whole wheat and whole wheat pastry flours. 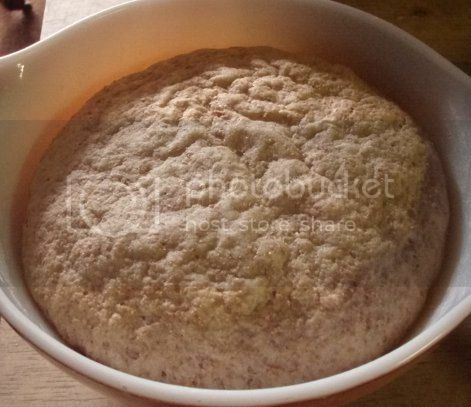 But since the recipe called for bread flour as part of the dry ingredients, I tossed in a little vital wheat gluten as well. This time, I remembered to knead it for the recommended 10 minutes and, as you can see, it rose beautifully. The texture was lovely, and the smell? Delicious, even before it got anywhere neat the oven. I still had a pizza’s worth of Classic Tomato Sauce in the freezer, so that became the bottom sauce. Next up were layers of minced garlic and onions, sliced mushrooms, multicolored bell peppers and chopped artichoke hearts. 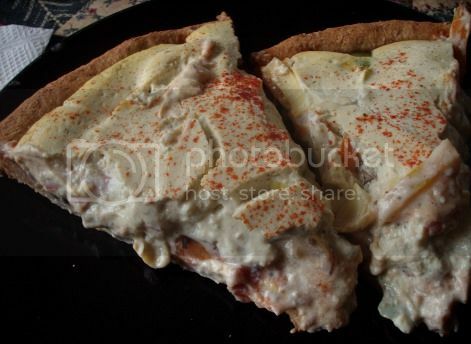 I love artichoke hearts on pizza, but in keeping with the “no added oil” theme of the book, I made sure to buy some that were canned in water rather than floating in a jar of marinade. For the topping sauce, I went with the simple Tofu and Lemon Sauce recipe. Before you ask, yes, it is as amazing as it looks. And it couldn’t be easier to put together; just toss the ingredients in the blender and go! The flavor is simple as well, making it the perfect canvas for whatever seasonings you want to add. I put in some dry basil and marjoram along with fresh thyme and a pinch of cayenne. 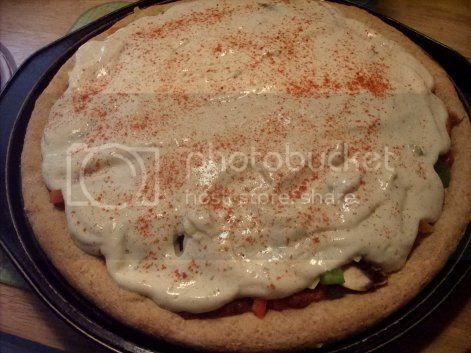 Then I took the optional paprika and sprinkled it on top of the pizza rather than blending it into the sauce. I know it’s only the second sauce I’ve tried from Heart Healthy Pizza, but this is my new favorite sauce. Ever. It cooked up with a thick, custard-like texture and a slight “crust” around the edges, and the flavor was unlike anything I’ve had before. There was an almost fluffy dimension to it that’s hard to describe. It could definitely be used to good effect in pasta bakes instead of faux cheese. And again, given that the ingredients are very basic, you could adapt it to literally any flavor profile.